The only clear change I can find in this proto is that the Moai head boss in the intro only takes 5 hits in this version, where it takes 7 hits in the final. There's quite a few changes in the code, though, so I expect there's other differences later in the game. A menu with all hidden commands is displayed. Please use 1P controller in numerical order. While it sounds like the game is expecting some kind of controller code, pushing any button just moves on to the next stage. Maybe it's a feature from an earlier build that was disabled in this version? And, I don't know if this was just a bug, or an intentional limitation of this build, but I wasn't able to get the keys to clear level 2 to show up, even after multiple tries. Thanks to ArnoldRimmer83 for his input on the various changes in this build. I don't remember having seen an ASO proto anywhere. Was it supposed to be released? I know. There is neither an ASO nor an Alpha Mission Beta anywhere are far as I can see. Or did the comment refer to something else? I could've sworn I posted it somewhere. Anyway, here it is again. I don't know about any possible differences. 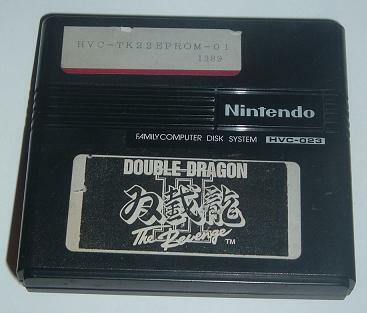 I found that cart on Famicom-world and immediately suspected it would be this one. Thanks a lot - will check it out. Didn't know where else to post so here goes... just noticed that that Double Dragon 2 sample dump available on Skrybe's site has some cheats enabled. "In game hold on first controller Select then press on first controller A to skip current level, B kill all curent enemies and advance to next point, Up or Down to kill one nearest enemy at front or back side." Wait, that's the proto Skrybe dumped for me, or is this a different one? Skrybe? Hmmm...I thought my prpto was identical to the release. After Aliens it's hard to post anything, but here's two very boring rom dumps. One is Bird Week, which seems to have doubled in size, maybe to fit the EPROMs it was burned on? This is 48kb and the released version is 24kb. Konami's Crisis Force just ends after a two levels, and probably tells you to buy the whole game. One of them demos like Goonies 2. I'd appriciate if someone could post the translation? Also, is it possible to skip to level 3 somehow? I see the graphics for the advertisement text replace most of the boss graphics. That was quick! Nice job! Crisis Force is awesome and all, but whatever happened with Aigina's Prophecy? I kind of wanted to make a CIB release of it, not for the money really but just because I wanted to design the box and manual based on the C64 release. I had it pretty much figured out but I lost it on a hard drive crash. Oh well, that might've been a dumb idea anyway. I just want to see it in a box when there's official cover art and a manual available. If I don't do it, I know someone will, and poorly. I want to release it properly. I know that kind of goes against the LL code but ROM will be released eventually. As long as the rom gets released, that's cool. I just hope it happens sooner rather than later.